Blog and online archive covering a broad range of subjects, including - but not limited to - UFO's, cryptozoology, and miscellaneous Forteana, often within a Danish context. The common theme throughout most of the entries, is the tracing of various influences, patterns, and synchronicities. As those who study a sufficiently large amount of UFO reports will eventually realize, a handful of well-defined themes and elements tend to stand out and keep recurring. What is frustrating, is that they often do so in (what at least seems like) a random and nonsensical manner. This is most obvious when comparing earlier ”landing” type cases, before abductions began to dominate the picture. It almost seems like variations of a sci-fi themed theatre play was being acted out again and again, with the help of involuntary bystanders. One of the recurring "props" that have fascinated me the most, for some reason, have been the strange boxes employed in one way or another by UFO occupants, particularly in CE3 (close encounters of the third kind) reports. I have long been curious about how this particular element has ”spread” over time, across the world. Are there perhaps some genuine patterns to be found here? Consider this the first in a series of articles, where i attempt to answer that question. 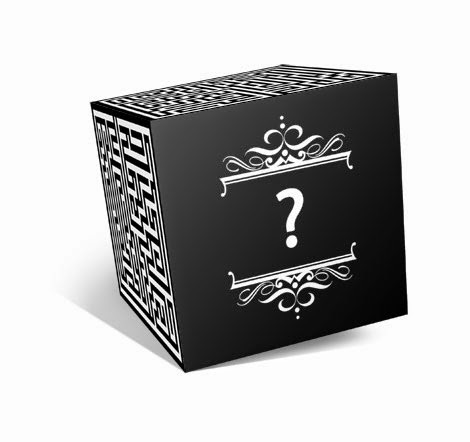 While several CE3 cases share similar traits, boxes aren't nearly as common an element as, say, the taking of ground samples, or the paralysis of witnesses (strange boxes have appeared in both these kinds of scenarios as well, though), but there are several interesting ”box cases” that go way back. Furthermore, many classic and high-profile UFO cases turns out to involve boxes, when you look a little closer at them. For example, a ”black box” is said to have been recovered among the Roswell debris in 1947, and two large, cube-shaped objects were supposedly found somewhere within the Tunguska impact area in 2004 (interpreted by some Russian ufologists to be leftovers from a crash between a UFO and a comet). I will get around to covering these types of cases too, eventually. But this first post will focus mainly on box-like devices in connection with UFO occupants. My main point of departure has been Albert Rosales' extensive catalogue of Human Sighting Reports, but I have expanded with many additional sources. In searching through Albert's reports, I looked for the recurrence of the words ”box” and ”cube” in every .pdf file. This has taken a lot of time - both to read through, but also to sort into a meaningful narrative for analysis. Consequently, a lot has been filtered out. For example, there are many reports involving ”boxes” which, on closer inspection, appear more like astronaut or diving gear, or are stated explicitly as being more like large containers on board flying saucers, used in the collection of samples...and so on. Also, there were quite a few that involved box or cube-shaped craft, especially from the 1990's onward. I decided to discard most of these, and focus mainly on those reports that involve boxes with (seemingly) superior technological or magical/supernatural qualities. The earliest examples I could find of humanoid encounter cases involving boxes, are the Japanese Utsuro Bune stories from the early 1800's. 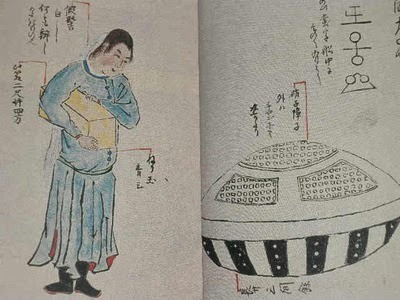 These stories have been interpreted as spaceship visitations by some ufologists, but Japanese scholars have pointed out that they are actually a continuation of earlier, local legends. There are certain features that are reminiscent of mermaid encounters as well. A more precise date of the first of these alleged encounters, the 22nd of February 1803, is mentioned in Jenny Randles' Abduction. On this day, a group of Japanese fishermen from the Hitachi province found a drifting vessel, which they proceeded to tow back to land. This particular ”ship” had a shape reminiscent of a Japanese incense burner. In some drawings it looks very much like the UFO that Travis Walton encountered. 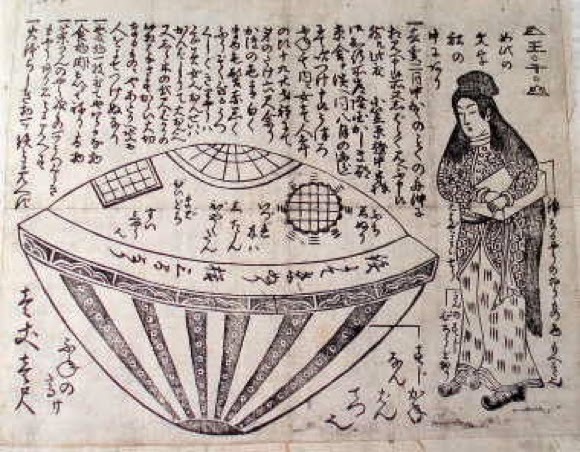 In later variants of the story, the ship is described as looking more like a ”kama” cooking pot - an object that actually looks more like your standard flying saucer. The following details are more or less the same across all of the known reports: The ship is partially transparent, and, looking inside, the fishermen see various strange symbols and writings on the walls. Inside they also discover a very short (1.5 meters tall), young woman with red hair and pink skin, dressed in strange garbs. The woman speaks in a language unknown to the fishermen and is carrying a 1 meter long square box. She is described as friendly, but clutching the box to her intensely at all times. No matter what the fishermen do, they are never allowed to look inside, or even come near it. Check the video clip below for more. The figures proceeded to place a pen on top of the box, which went on an automated writing spree (in a language that later turned out to be a form of Hebrew). Concerning the ”ancient clothing”, this site alludes to the possibility that it might be cowls or tunics. This is interesting, as it appears a lot in later box cases. The next report takes us back to Japan, some time during the summer of 1926. A two-year old boy named Warabe, who had several prior contacts, was telepathically summoned outside one night, by a young man with long golden hair. Over the following years the boy was given many gifts by this man (who he came to call ”Uncle”). Among the gifts was a metallic box with some curious carvings of a triangle/pyramid on top and snakes on the sides. 8 years later, in Mayaguez, Puerto Rico, a young man named Juan Rivera Felliberti was flying his kite one morning, when he was suddenly interrupted by a 20 ft spherical, silvery object in the sky. The ”craft” snatched his kite and subsequently beamed him up. Inside, he encountered a male and a female humanoid. The male wore a tight-fitting green outfit, and the female, who was holding his kite, was described as pink-skinned with platinum blonde hair, wearing a silvery suit. She looked no more more than six years old. Juan asked for his kite back, but she refused. Instead she proceeded to show him a box which emitted various images. After this, he was shown yet another, smaller box, which he was encouraged to play with. The woman pressed a button on this 20x20x20 cm cube-shaped box, and smoke came swirling out, transforming into several small ”monkey-like” creatures. Juan traded the box for his kite and kept it for many years, entertaining several of his friends with the ”monkey trick”. He later buried the box because he had trouble controlling the creatures, which would always escape from him after having manifested. They allegedly caused serious mischief around Puerto Rico, and were even rumored to have been involved in a series of deaths. Juan felt that some of them were still alive and roaming the countryside many years later. Finnish ufologist Heikki Virtanen reports an encounter from 1939 in Saarijärvi, Finland, that took place the day before the great Winter War with Russia began. A 14 year old boy, Arvo, was collecting firewood in the forest together with his father, when he saw something curious in the distance. At first he assumed that it was a moonshine factory, and since he had never seen one of these before, he went in for a closer look. It turned out to be something quite different: an object shaped like a kettle at the bottom and narrowing at the top. From the bottom, flames of different colours shot out. Outside the object, a 1.60 meter tall human-like entity in (what must later have been interpreted as) an astronaut-style suit, was standing. It had a box in its hands, which it seemed to be directing a couple of nearby robots. Certain parts of the above may sound familiar, and there is a good reason why. 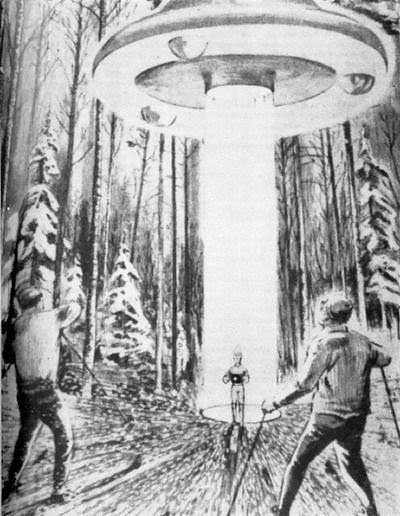 The 1970 Imjärvi encounter is one of the most memorable and recognizable in UFO history - especially because of the illustrations that have accompanied it whenever it has been featured. Both cases share many of the same details. Well-known illustration of the Imjärvi CE3. Looking at the details of the case as they emerged in the pages of Flying Saucer Review (beginning with issue 3, 1970), however, it becomes clear that the story was compartmentalized - although perhaps not conciously. Initially, the related encounter only described what could "simply" be an exotic weather phenomenon. It then developed into also including an ”object” similar to an ”Adamski” saucer (in issue 4, 1970). Finally, in the following issue, the now legendary humanoid was revealed. There are also some discrepancies between Heinonen and Viljo's statements, although this can be due to gradually recovered memories. I won't go any further into that matter. Just consider it as a disclaimer from which you can draw your own conclusions. On January 7th,, 1970, Aarno Heinonen and Esko Viljo, both in their 30's at the time, were out skiing. At some point they heard a buzzing noise and saw a light coming at them from the same direction. The light came gradually closer, and then a reddish-gray colored mist appeared around it. From this mist emerged a disc-shaped metallic object, about 10 feet in diameter, which descended until it was 10-12 feet off the ground. Heinonen described it as being so close that he could touch it with his ski staff. Then, suddenly, a light shot out from the bottom of the disc, accompanied by sparks and flames, illuminating a small area on the ground in front of them. Then followed another swirl of reddish-gray mist. When this had disappeared once more, they saw a 3ft tall entity standing in front of them, dressed in a light green coverall, dark green boots, white elbow-length gauntlets and a conically-shaped helmet. It's skin was pale, as if made of wax, and it had a strange, hooked nose. In its hand it was carrying a black box with a yellow pulsating light, which it pointed towards Heinonen. Shortly after, it disappeared again, and so did the flying disc. Both men were left with serious physiological side effects, but Heinonen developed the most serious symptoms. They also both had a series of further ”supernatural” experiences. Heino claimed many later UFO-sightings, two encounters with a female spacewoman (who summoned him to a secluded area via telepathy), and on top of this developed psychic abilities in the wake of the initial experience. 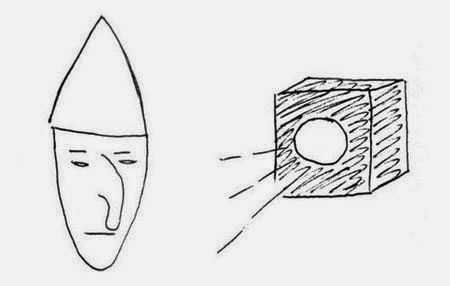 Sketch of the Imjärvi humanoid's face, and it's mysterious box. That Heinonen and Viljo saw something, seems to be confirmed by the fact that there were other witnesses in the area who saw a strange light in the sky at the same time. But even more interesting is the fact that an encounter took place about 100 meters from there, less than a year before. In February of 1969, Matti Kontulainen (16 years old at the time) was skiing through the forest at night, when suddenly an intensely bright light flew by, just above treetop level. He decribed it looking like ”a huge welding flame”. So, in the three Finnish reports above, we also have the curious occurence of strange flames – not the most common element found in UFO reports of this kind. It might also be of interest, that a legendary Finnish nightclub, The Funky Maruschka, opened close to Imjärvi a few years later. At least one person i know, who visited the club as a young man, has expressed the opinion that this is probably not a coincidence. On August 19th of that year, a father and his son - Matti and Teuvo Kuningas – strayed away from the rest of their family (the mother and younger brother), while out picking blueberries. Suddenly, they saw what looked like a giant stone about 30 meters away inside the forest. On further inspection, they encountered a 1 meter tall, broad-shouldered entity, with skin the colour of a carrot and wearing a green overall. It had a box-like device on it's chest, from which came some kind of a flashing light. The entity made a number of strange sounds and movements before it disappeared. They both experienced missing time and memory loss, but after about six months Teuvo remembered the above details and related it to his younger brother, Tapani. The father also recalled many of the details later on. Tapani Kuningas, by the way, later became one of Finlands most active ufologists. I have already started to draw attention to the shared details of these cases, but even more will become obvious later on. I also plan on making a seperate post exclusively about mythological and fairy-tale precursors, but i should mention in passing that i have looked into the tradition of Finnish folklore and fairytales, for potential sources of influence. I was not able to find any particularly affinity for stories about mysterious boxes, although there is indeed a tradition of magic objects, such as purses that supply an endless amount of riches, magic handkerchiefs, etc. I did find mention of a ”magic tinderbox”, but nothing that really matches the box of the Imjärvi entity.